Harry Potter and the Philosopher's Stone (released in the United States, India and Pakistan as Harry Potter and the Sorcerer's Stone) is a 2001 fantasy film directed by Chris Columbus and distributed by Warner Bros. Pictures. It is based on J. K. Rowling's 1997 novel of the same name. The film is the first instalment of the Harry Potter film series and was written by Steve Kloves and produced by David Heyman. Its story follows Harry Potter's first year at Hogwarts School of Witchcraft and Wizardry as he discovers that he is a famous wizard and begins his education. The film stars Daniel Radcliffe as Harry Potter, with Rupert Grint as Ron Weasley, and Emma Watson as Hermione Granger. Warner Bros. bought the film rights to the book in 1999 for a reported £1 million ($1.65 million in 1999). Production began in the United Kingdom in 2000, with Chris Columbus being chosen to create the film from a short list of directors that included Steven Spielberg and Rob Reiner. Rowling insisted that the entire cast be British and Irish, and the film was shot at Leavesden Film Studios and historic buildings around the United Kingdom. The film was released to cinemas in the United Kingdom and United States on 16 November 2001. It became a critical and commercial success, grossing $975.1 million at the box office worldwide. 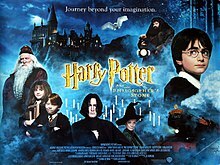 The highest-grossing film of 2001, it is the 38th highest-grossing of all-time (2nd at the time of its release) and the second most successful instalment of the Harry Potter series behind Deathly Hallows – Part 2. The film was nominated for many awards, including Academy Awards for Best Original Score, Best Art Direction and Best Costume Design. It was followed by seven sequels, beginning with Harry Potter and the Chamber of Secrets in 2002 and ending with Harry Potter and the Deathly Hallows – Part 2 in 2011, nearly ten years after the first film's release. In late 1981, Albus Dumbledore, Minerva McGonagall, and Rubeus Hagrid, professors of Hogwarts School of Witchcraft and Wizardry, deliver a recently orphaned infant named Harry Potter to his only remaining relatives, the Dursleys. Ten years later, Harry has been battling a disjointed life with the Dursleys. After inadvertently causing an accident during a family trip to the zoo, Harry begins receiving unsolicited letters by owls. After the Dursleys escape to an island to avoid more letters, Hagrid re-appears and informs Harry that he is actually a wizard and has been accepted into Hogwarts against the Dursleys' wishes. After taking Harry to Diagon Alley to buy his supplies for Hogwarts and a pet owl named Hedwig as a birthday present, Hagrid informs him of his past; Harry's parents James and Lily Potter met their demise via a Killing Curse at the hands of the malevolent and all-powerful wizard: Lord Voldemort. Harry, the only survivor in the chaos, thus becomes well-known in the wizarding world as "The Boy Who Lived". Harry is then taken to King's Cross station to board a train to Hogwarts, where he meets three other students: Ron Weasley, whom he quickly befriends; Hermione Granger, an intelligent witch born to muggle parents; and Draco Malfoy, a boy from a wealthy wizarding family, with whom he immediately clashes. After arriving at school the students assemble in the Great Hall, where all the first-years are sorted by the Sorting Hat between four houses: Gryffindor, Hufflepuff, Ravenclaw, and Slytherin. Although the Sorting Hat considers putting Harry in Slytherin with Draco, he is placed into Gryffindor alongside Ron and Hermione. At Hogwarts, Harry begins learning magic spells and discovers more about his past and parents. After recovering the Remembrall of Gryffindor student Neville Longbottom, Harry is recruited for Gryffindor's Quidditch team as a Seeker, an extremely rare feat for first-year students. On their way to the dorms one night the stair cases change paths leading the three to the forbidden floor of Hogwarts, Harry, Ron, and Hermione discover a giant three-headed dog named Fluffy in a restricted area of the school. Ron then insults Hermione after being embarrassed by her in a charms lesson, causing Hermione to lock herself in the girls' bathroom. She is attacked by a marauding troll, but Harry and Ron save her - befriending her in the process. The children later find out Fluffy is guarding the Philosopher's Stone, an object that has the power to turn any metal into gold and produce a potion that grants immortality. Harry suspects that potions teacher and head of Slytherin House Severus Snape is trying to obtain the stone in order to return Voldemort to physical form. Hagrid accidentally reveals to the trio that Fluffy will fall asleep if played music. Harry, Ron, and Hermione decide that night to try and find the stone before Snape. They discover an already asleep Fluffy and face a series of safeguards including a deadly plant known as Devil's Snare, a room filled with aggressive flying keys that bruise Harry, and a dangerous life-sized game of chess that almost kills Ron. After getting past the tasks, Harry discovers that it was Defence Against the Dark Arts teacher Quirinus Quirrell who was trying to claim the stone: Snape had actually been protecting Harry all along. Quirrell removes his turban and reveals a weak Voldemort living on the back of his head. Through an enchantment placed by Dumbledore, Harry finds the stone in his possession. Voldemort attempts to bargain the stone from Harry in exchange for reviving his parents, but Harry refuses. Quirrell attempts to kill Harry in response; however, he is instead killed after Harry ends up burning his skin - reducing Quirrell to dust and causing Voldemort's to rise from his ashes. Harry is knocked unconscious in the process. Harry recovers in the school hospital with Dumbledore at his side. Dumbledore explains that the stone has been destroyed and that Ron and Hermione are safe. Dumbledore also reveals how Harry was able to defeat Quirrell: when Harry's mother died to save him, her death gave Harry a love-based protection against Voldemort. Harry, Ron, and Hermione are rewarded with house points for their heroic performances - tying them for first place with Slytherin. Dumbledore then awards ten points to Neville for attempting to stop the trio, granting Gryffindor the House Cup. Harry returns home for the summer, happy to finally have a real home in Hogwarts. Rowling insisted that the cast be kept British. Susie Figgis was appointed as casting director, working with both Columbus and Rowling in auditioning the lead roles of Harry, Ron and Hermione. Open casting calls were held for the main three roles, with only British children being considered. The principal auditions took place in three parts, with those auditioning having to read a page from the novel, then to improvise a scene of the students' arrival at Hogwarts, and finally to read several pages from the script in front of Columbus. Scenes from Columbus' script for the 1985 film Young Sherlock Holmes were also used in auditions. On 11 July 2000, Figgis left the production, complaining that Columbus did not consider any of the thousands of children they had auditioned "worthy". On 8 August 2000, the virtually unknown Daniel Radcliffe and newcomers Rupert Grint and Emma Watson were selected to play Harry Potter, Ron Weasley and Hermione Granger, respectively. Daniel Radcliffe as Harry Potter, an 11-year-old orphan raised by his unwelcoming aunt and uncle, who learns of his own fame as a wizard known to have survived his parents' murder at the hands of the psychopathic dark wizard Lord Voldemort as an infant when he is accepted to Hogwarts School of Witchcraft and Wizardry. Columbus had wanted Radcliffe for the role since he saw him in the BBC's production of David Copperfield, before the open casting sessions had taken place, but had been told by Figgis that Radcliffe's protective parents would not allow their son to take the part. Columbus explained that his persistence in giving Radcliffe the role was responsible for Figgis' resignation. Radcliffe was asked to audition in 2000, when Heyman and Kloves met him and his parents at a production of Stones in His Pockets in London. Heyman and Columbus successfully managed to convince Radcliffe's parents that their son would be protected from media intrusion, and they agreed to let him play Harry. Rowling approved of Radcliffe's casting, stating that "having seen [his] screen test I don't think Chris Columbus could have found a better Harry." Radcliffe was reportedly paid £1 million for the film, although he felt the fee was "not that important". William Moseley, who was later cast as Peter Pevensie in The Chronicles of Narnia series, also auditioned for the role. Rupert Grint as Ron Weasley, Harry's best friend at Hogwarts. A fan of the series, Grint decided he would be perfect for the part "because [he has] ginger hair". Having seen a Newsround report about the open casting he sent in a video of himself rapping about how he wished to receive the part. His attempt was successful as the casting team asked for a meeting with him. Emma Watson as Hermione Granger, Harry's other best friend and the trio's brains. Watson's Oxford theatre teacher passed her name on to the casting agents and she had to do over five interviews before she got the part. Watson took her audition seriously, but "never really thought [she] had any chance of getting the role." The producers were impressed by Watson's self-confidence and she outperformed the thousands of other girls who had applied. Tom Felton as Draco Malfoy, the trio's enemy. John Cleese as Nearly Headless Nick, the ghost of Hogwarts' Gryffindor House. Robbie Coltrane as Rubeus Hagrid, a half-giant and Hogwarts' Groundskeeper. Coltrane was one of the two actors Rowling wanted most, along with Smith as McGonagall. Coltrane, who was already a fan of the books, prepared for the role by discussing Hagrid's past and future with Rowling. According to Figgis, Robin Williams was interested in participating in the film, but was turned down for the Hagrid role because of the "strictly British and Irish only" rule which Columbus was determined to maintain. Warwick Davis as Filius Flitwick, the Charms Master and head of Hogwarts' Ravenclaw House. Davis also plays two other roles in the film: the Goblin Head Teller at Gringotts, and dubs the voice of Griphook, who is embodied by Verne Troyer. Richard Griffiths as Vernon Dursley, Harry's Muggle uncle. Ian McNeice was considered for the role of Vernon. Richard Harris as Albus Dumbledore, Hogwarts' Headmaster and one of the most famous and powerful wizards of all time. Harris initially rejected the role, only to reverse his decision after his granddaughter stated she would never speak to him again if he did not take it. Ian Hart as Quirinus Quirrell, the slightly nervous Defence Against the Dark Arts teacher at Hogwarts, and also Lord Voldemort's voice. David Thewlis auditioned for the part; he would later be cast as Remus Lupin in Harry Potter and the Prisoner of Azkaban. John Hurt as Mr. Ollivander, the owner of Ollivanders, a highly regarded wandmaker. Alan Rickman as Severus Snape, the Potions Master and head of Hogwarts' Slytherin House. Tim Roth was the original choice for the role, but he turned it down for Planet of the Apes. Maggie Smith as Minerva McGonagall, the Deputy Headmistress, head of Gryffindor and transfiguration teacher at Hogwarts. Smith was one of the two actors Rowling wanted most, along with Coltrane as Hagrid. Verne Troyer as Griphook, a goblin who works at Gringotts. His voice is dubbed by Warwick Davis. Julie Walters as Molly Weasley, Ron's caring mother. She shows Harry how to get to Platform ​9 3⁄4. Before Walters was cast, American actress Rosie O'Donnell held talks with Columbus about playing Mrs. Weasley. In 1997, producer David Heyman searched for a children's book that could be adapted into a well-received film. He had planned to produce Diana Wynne Jones' novel The Ogre Downstairs, but his plans fell through. His staff at Heyday Films then suggested Harry Potter and the Philosopher's Stone, which his assistant believed was "a cool idea." Heyman pitched the idea to Warner Bros. and in 1999, Rowling sold the company the rights to the first four Harry Potter books for a reported £1 million (US$1,982,900). A demand Rowling made was that the principal cast be kept strictly British, nonetheless allowing for the inclusion of Irish actors such as Richard Harris as Dumbledore, and for casting of French and Eastern European actors in Harry Potter and the Goblet of Fire where characters from the book are specified as such. Rowling was hesitant to sell the rights because she "didn't want to give them control over the rest of the story" by selling the rights to the characters, which would have enabled Warner Bros. to make non-author-written sequels. Although Steven Spielberg initially negotiated to direct the film, he declined the offer. Spielberg reportedly wanted the adaptation to be an animated film, with American actor Haley Joel Osment to provide Harry Potter's voice, or a film that incorporated elements from subsequent books as well. Spielberg contended that, in his opinion, it was like "shooting ducks in a barrel. It's just a slam dunk. It's just like withdrawing a billion dollars and putting it into your personal bank accounts. There's no challenge." Rowling maintains that she had no role in choosing directors for the films and that "[a]nyone who thinks I could (or would) have 'veto-ed' [ sic ] him [Spielberg] needs their Quick-Quotes Quill serviced." Heyman recalled that Spielberg decided to direct A.I. Artificial Intelligence instead. After Spielberg left, talks began with other directors, including: Chris Columbus, Terry Gilliam, Jonathan Demme, Mike Newell, Alan Parker, Wolfgang Petersen, Rob Reiner, Ivan Reitman, Tim Robbins, Brad Silberling, M. Night Shyamalan and Peter Weir. Petersen and Reiner both pulled out of the running in March 2000, and the choice was narrowed down to Silberling, Columbus, Parker and Gilliam. Rowling's first choice director was Terry Gilliam, but Warner Bros. chose Columbus, citing his work on other family films such as Home Alone and Mrs. Doubtfire as influences for their decision. Columbus pitched his vision of the film for two hours, stating that he wanted the Muggle scenes "to be bleak and dreary" but those set in the wizarding world "to be steeped in color, mood, and detail." He took inspiration from David Lean's adaptations of Great Expectations (1946) and Oliver Twist (1948), wishing to use "that sort of darkness, that sort of edge, that quality to the cinematography," while being further inspired by the colour designs from Oliver! (1968) and The Godfather (1972). "Harry Potter is the kind of timeless literary achievement that comes around once in a lifetime. Since the books have generated such a passionate following across the world, it was important to us to find a director that has an affinity for both children and magic. I can't think of anyone more ideally suited for this job than Chris." Steve Kloves was selected to write the screenplay. He described adapting the book as "tough", as it did not "lend itself to adaptation as well as the next two books." Kloves often received synopses of books proposed as film adaptations from Warner Bros., which he "almost never read", but Harry Potter jumped out at him. He went out and bought the book, and became an instant fan of the series. When speaking to Warner Bros., he stated that the film had to be British, and had to be true to the characters. Kloves was nervous when he first met Rowling as he did not want her to think he was going to "[destroy] her baby." Rowling admitted that she "was really ready to hate this Steve Kloves," but recalled her initial meeting with him: "The first time I met him, he said to me, 'You know who my favourite character is?' And I thought, You're gonna say Ron. I know you're gonna say Ron. But he said 'Hermione.' And I just kind of melted." Rowling received a large amount of creative control, an arrangement that Columbus did not mind. Warner Bros. had initially planned to release the film over 4 July 2001 weekend, making for such a short production window that several proposed directors pulled themselves out of the running. Due to time constraints, the date was put back to 16 November 2001. Alnwick Castle was used as a principal filming location for Hogwarts. Two British film industry officials requested that the film be shot in the United Kingdom, offering their assistance in securing filming locations, the use of Leavesden Film Studios, as well as changing the UK's child labour laws (adding a small number of working hours per week and making the timing of on-set classes more flexible). Warner Bros. accepted their proposal. Filming began on 29 September 2000 at Leavesden Film Studios and concluded on 23 March 2001, with final work being done in July. Principal photography took place on 2 October 2000 at North Yorkshire's Goathland railway station. Canterbury Cathedral and Scotland's Inverailort Castle were both touted as possible locations for Hogwarts; Canterbury rejected Warner Bros. proposal due to concerns about the film's "pagan" theme. Alnwick Castle and Gloucester Cathedral were eventually selected as the principal locations for Hogwarts, with some scenes also being filmed at Harrow School. Other Hogwarts scenes were filmed in Durham Cathedral over a two-week period; these included shots of the corridors and some classroom scenes. Oxford University's Divinity School served as the Hogwarts Hospital Wing, and Duke Humfrey's Library, part of the Bodleian, was used as the Hogwarts Library. Filming for Privet Drive took place on Picket Post Close in Bracknell, Berkshire. Filming in the street took two days instead of the planned single day, so payments to the street's residents were correspondingly increased. For all the subsequent film's scenes set in Privet Drive, filming took place on a constructed set in Leavesden Film Studios, which proved to have been cheaper than filming on location. London's Australia House was selected as the location for Gringotts Wizarding Bank, while Christ Church, Oxford was the location for the Hogwarts trophy room. London Zoo was used as the location for the scene in which Harry accidentally sets a snake on Dudley, with King's Cross Station also being used as the book specifies. 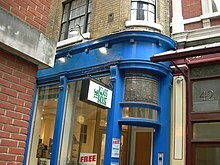 The store in London used as the exterior of The Leaky Cauldron. Because the American title was different, all scenes that mention the philosopher's stone by name had to be re-shot, once with the actors saying "philosopher's" and once with "sorcerer's". The children filmed for four hours and then did three hours of schoolwork. They developed a liking for fake facial injuries from the makeup staff. Radcliffe was initially meant to wear green contact lenses as his eyes are blue, and not green like Harry's, but the lenses gave Radcliffe extreme irritation. Upon consultation with Rowling, it was agreed that Harry could have blue eyes. Judianna Makovsky designed the costumes. She re-designed the Quidditch robes, having initially planned to use those shown on the cover of the American book, but deemed them "a mess." Instead, she dressed the Quidditch players in "preppie sweaters, 19th century fencing breeches and arm guards." Production designer Stuart Craig built the sets at Leavesden Studios, including Hogwarts Great Hall, basing it on many English cathedrals. Although originally asked to use an existing old street to film the Diagon Alley scenes, Craig decided to build his own set, comprising Tudor, Georgian and Queen Anne architecture. Columbus originally planned to use both animatronics and CGI animation to create the magical creatures, including Fluffy. Nick Dudman, who worked on Star Wars: Episode I – The Phantom Menace, was given the task of creating the needed prosthetics, with Jim Henson's Creature Shop providing creature effects. John Coppinger stated that the magical creatures that needed to be created had to be designed multiple times. The film features nearly 600 special effects shots, involving numerous companies. Industrial Light & Magic created Lord Voldemort's face on the back of Quirrell, Rhythm & Hues animated Norbert (Hagrid's baby dragon); and Sony Pictures Imageworks produced the Quidditch scenes. John Williams was selected to compose the score. Williams composed the score at his homes in Los Angeles and Tanglewood before recording it in London in September 2001. One of the main themes is entitled "Hedwig's Theme"; Williams retained it for his finished score as "everyone seemed to like it" and therefore it was a recurring theme throughout the series. Columbus repeatedly checked with Rowling to make sure he was getting minor details correct. Kloves described the film as being "really faithful" to the book. He added dialogue, of which Rowling approved. One of the lines originally included had to be removed after Rowling told him that it would directly contradict an event in the then-unreleased fifth Harry Potter novel Harry Potter and the Order of the Phoenix. Several minor characters have been removed from the film version, most prominent among them the spectral History of Magic teacher, Professor Binns, and Peeves the poltergeist. The book's first chapter is from the viewpoint of Vernon and Petunia Dursley the day before they are given Harry to look after, highlighting how non-magical people react to magic. The film removes this, beginning with Professor Dumbledore, Professor McGonagall and Hagrid leaving Harry with the Dursleys (although McGonagall tells Dumbledore how she had been watching the Dursleys all day). Harry's less than pleasant times at Mrs. Figg's are cut from the film while the boa constrictor from Brazil in the zoo becomes a Burmese Python in the film. Some conflicts, such as Harry and Draco's encounter with each other in Madam Malkin's robe shop and midnight duel, are not in the film. Some of Nicolas Flamel's role is changed or cut altogether. Norbert is mentioned to have been taken away by Dumbledore in the film; whilst the book sees Harry and Hermione have to take him by hand to Charlie Weasley's friends. Rowling described the scene as "the one part of the book that she felt [could easily] be changed". As a result, the reason for the detention in the Forbidden Forest was changed: In the novel, Harry and Hermione are put in detention for being caught by Filch when leaving the Astronomy Tower after hours, Neville and Malfoy are given detention when caught in the corridor by Professor McGonagall. In the film, Harry, Hermione and Ron receive detention after Malfoy catches them in Hagrid's hut after hours (Malfoy however, is given detention for being out of bed after hours). Firenze the centaur, who is described in the book as being palomino with light blonde hair, is shown to be dark in the film. The Quidditch pitch is altered from a traditional stadium to an open field circled by spectator towers. In the trio's final quest for the Philosopher's Stone, Hermione's test, solving a logic problem about a row of bottles, is omitted. The first teaser poster was released on 1 December 2000. The first teaser trailer was released via satellite on 2 March 2001 and debuted in cinemas with the release of See Spot Run. The soundtrack was released on 30 October 2001 in a CD format. A video game based on the film was released on 15 November 2001 by Electronic Arts for several consoles. A port for the game, for the GameCube, PlayStation 2, and Xbox was released in 2003. Mattel won the rights to produce toys based on the film, to be sold exclusively through Warner Brothers' stores. Hasbro also produced products, including confectionery products based on those from the series. Warner Bros. signed a deal worth US$150 million with Coca-Cola to promote the film, and Lego produced a series of sets based on buildings and scenes from the film, as well as a Lego Creator video game. Warner Bros. first released the film on VHS and DVD on 11 February 2002 in the E3 UK 11 May 2002 in the UK and 28 May 2002 in the US. The VHS and DVD (The Special Edition) was re-released in 7 May 2004 An Ultimate Edition was later released exclusively in the US that included a Blu-ray and DVD. The release contains an extended version of the film, with many of the deleted scenes edited back in; additionally, the set includes the existing special features disc, Radcliffe's, Grint's, and Watson's first screen tests, a feature-length special Creating the World of Harry Potter Part 1: The Magic Begins, and a 48-page hardcover booklet. The extended version has a running time of about 159 minutes, which has previously been shown during certain television airings. Between May and June 2002, the film sold 10 million copies, almost 60% of which were DVD sales. The film had its world premiere at the Odeon Leicester Square in London on 4 November 2001, with the cinema arranged to resemble Hogwarts School. The film was greatly received at the box office. In the United States, it made $32.3 million on its opening day, breaking the single day record previously held by Star Wars: Episode I – The Phantom Menace. On the second day of release, the film's gross increased to $33.5 million, breaking the record for biggest single day again. In total, it made $90.3 million during its first weekend, breaking the record for highest-opening weekend of all time that was previously held by The Lost World: Jurassic Park. It held the record until the following May when Spider-Man made $114.8 million in its opening weekend. The film held onto the No. 1 spot at the box-office for three consecutive weekends. The film also had the highest grossing 5-day (Wednesday-Sunday) Thanksgiving weekend record of $82.4 million, holding the title for twelve years until both The Hunger Games: Catching Fire and Frozen surpassed it with $110.1 million and $94 million respectively. Similar results were achieved across the world. In the United Kingdom, Harry Potter and the Philosopher's Stone broke the record for the highest-opening weekend ever, both including and excluding previews, making £16.3 million with and £9.8 million without previews. The film went on to make £66.1 million in the UK alone, making it the country's second highest-grossing film of all-time (after Titanic), until it was surpassed by Mamma Mia!. In total, the film earned $974.8 million at the worldwide box office, $317.6 million of that in the US and $657.2 million elsewhere, which made it the second highest-grossing film in history at the time, as well as the year's highest-grossing film. As of 2018[update], it is the unadjusted thirty-fourth highest-grossing film of all-time and the second highest-grossing Harry Potter film to date after Deathly Hallows – Part 2, which grossed more than $1 billion worldwide. Box Office Mojo estimates that the film sold over 55.9 million tickets in the US. On Rotten Tomatoes the film has an approval rating of 81% based on 195 reviews, with an average rating of 7.06/10. The site's critical consensus reads, "Harry Potter and the Sorcerer's Stone adapts its source material faithfully while condensing the novel's overstuffed narrative into an involving – and often downright exciting – big-screen magical caper." On Metacritic the film has a score of 64 out of 100, based on 36 critics, indicating "generally favorable reviews". On CinemaScore, audiences gave the film an average grade of "A" on an A+ to F scale. Roger Ebert called Philosopher's Stone "a classic," giving the film four out of four stars, and particularly praising the Quidditch scenes' visual effects. Praise was echoed by both The Telegraph and Empire reviewers, with Alan Morrison of the latter naming it the film's "stand-out sequence". Brian Linder of IGN.com also gave the film a positive review, but concluded that it "isn't perfect, but for me it's a nice supplement to a book series that I love". Although criticising the final half-hour, Jeanne Aufmuth of Palo Alto Online stated that the film would "enchant even the most cynical of moviegoers." USA Today reviewer Claudia Puig gave the film three out of four stars, especially praising the set design and Robbie Coltrane's portrayal of Hagrid, but criticised John Williams' score and concluded "ultimately many of the book's readers may wish for a more magical incarnation." The sets, design, cinematography, effects and principal cast were all given praise from Kirk Honeycutt of The Hollywood Reporter, although he deemed John Williams' score "a great clanging, banging music box that simply will not shut up." Todd McCarthy of Variety compared the film positively with Gone with the Wind and put "The script is faithful, the actors are just right, the sets, costumes, makeup and effects match and sometimes exceed anything one could imagine." Jonathan Foreman of the New York Post recalled that the film was "remarkably faithful," to its literary counterpart as well as a "consistently entertaining if overlong adaptation." Richard Corliss of Time magazine, considered the film a "by the numbers adaptation," criticising the pace and the "charisma-free" lead actors. CNN's Paul Tatara found that Columbus and Kloves "are so careful to avoid offending anyone by excising a passage from the book, the so-called narrative is more like a jamboree inside Rowling's head." Nathaniel Rogers of The Film Experience gave the film a negative review and wrote: "Harry Potter and the Sorceror's Stone is as bland as movies can get." Ed Gonzalez of Slant Magazine wished that the film had been directed by Tim Burton, finding the cinematography "bland and muggy," and the majority of the film a "solidly dull celebration of dribbling goo." Elvis Mitchell of The New York Times was highly negative about the film, saying "[the film] is like a theme park that's a few years past its prime; the rides clatter and groan with metal fatigue every time they take a curve." He also said it suffered from "a lack of imagination" and wooden characters, adding, "The Sorting Hat has more personality than anything else in the movie." The film received three Academy Award nominations: Best Art Direction, Best Costume Design, and Best Original Score for John Williams. The film was also nominated for seven BAFTA Awards. These were Best British Film, Best Supporting Actor for Robbie Coltrane, as well as the awards for Best Costume Design, Production Design, Makeup and Hair, Sound and Visual Effects. The film won a Saturn Award for its costumes, and was nominated for eight more awards. It won other awards from the Casting Society of America and the Costume Designers Guild. It was nominated for the AFI Film Award for its special effects, and the Art Directors Guild Award for its production design. It received the Broadcast Film Critics Award for Best Live Action Family Film and was nominated for Best Child Performance (for Daniel Radcliffe) and Best Composer (John Williams). In 2005 the American Film Institute nominated the film for AFI's 100 Years of Film Scores. ^ a b c d "HARRY POTTER AND THE SORCERER'S STONE (2001)". AFI Catalog of Feature Films. Retrieved 24 July 2018. ^ "Harry Potter and the Philosopher's Stone". British Board of Film Classification. Retrieved 10 December 2014. ^ "Harry Potter and the Sorcerer's Stone (2001)". British Film Institute. Retrieved 26 December 2017. ^ "British Council Film: Harry Potter and the Philosopher's Stone (aka Harry Potter and the Sorcerer's Stone)". British Council. Retrieved 26 December 2017. ^ a b c d "Harry Potter and the Sorcerer's Stone (2001)". Box Office Mojo. Retrieved 29 May 2007. ^ Anthikad-Chhibber, Mini. "Harry Comes to Hyderabad". The Hindu. Archived from the original on 4 November 2002. Retrieved 7 February 2010. ^ a b "Harry Potter and the Philosopher's Stone". Guardian Unlimited. 16 November 2001. Retrieved 26 May 2007. ^ a b Linder, Brian (30 March 2000). "Chris Columbus Talks Potter". IGN. Archived from the original on 6 December 2008. Retrieved 8 July 2007. ^ Linder, Brian (30 May 2000). "Attention All Muggles!". IGN. Archived from the original on 31 August 2011. Retrieved 8 July 2007. ^ a b Linder, Brian (14 June 2000). "Harry Potter Casting Frenzy". IGN. Archived from the original on 25 April 2009. Retrieved 8 July 2007. ^ a b Lindner, Brian (11 July 2000). "Trouble Brewing with Potter Casting?". IGN. Retrieved 7 February 2010. ^ "Daniel Radcliffe, Rupert Grint and Emma Watson Bring Harry, Ron and Hermione to Life for Warner Bros. Pictures Harry Potter and the Sorcerer's Stone". Warner Bros. 21 August 2000. Archived from the original on 4 April 2007. Retrieved 26 May 2007. ^ a b c d e f g h i j k l m n o p q r s Jensen, Jeff; Fierman, Daniel (14 September 2001). "Inside Harry Potter – It May Be a Movie about a Tyro Wizard and His Magical Adventures, but Bringing Harry Potter to the Big Screen Took Real Muggle Might, No Hocus-Pocus about It". Entertainment Weekly. Retrieved 7 February 2010. ^ Sussman, Paul (23 August 2000). "British Child Actor "a Splendid Harry Potter"". CNN. Archived from the original on 26 September 2014. Retrieved 7 February 2010. ^ Carroll, Larry (2 May 2008). ""Narnia" Star William Moseley Reflects on Nearly Becoming Harry Potter". MTV. Archived from the original on 28 September 2015. Retrieved 2 May 2008. ^ "Season of the Witch". Entertainment Weekly. 14 December 2001. Archived from the original on 20 December 2001. Retrieved 18 July 2010. ^ a b Bradley, Bill (31 December 2016). "The Hilarious Reason Daniel Radcliffe Was Cast As Harry Potter". The Huffington Post. Archived from the original on 31 December 2016. Retrieved 31 December 2016. ^ a b Davies, Hugh (14 August 2000). "Author's favourites are chosen for Potter film". The Daily Telegraph. Retrieved 24 December 2017. ^ Rowling, J. K. (2 November 2001). "JK Rowling interview in full". Newsround (Interview). Interviewed by Mzimba, Lizo. CBBC. Retrieved 31 December 2016. ^ "Robin Williams turned down for Potter". The Guardian. 15 November 2001. Retrieved 14 August 2015. ^ Sussman, Paul (22 August 2000). "Harry Potter: The search is finally over". CNN. Retrieved 12 January 2018. ^ Young, C. (27 November 2001). "Richard Harris: The Envelopes, Please". People. Archived from the original on 30 September 2007. Retrieved 9 July 2007. ^ Morris, Clint (9 June 2004). "Interview:David Thewlis". Movie Hole. Archived from the original on 12 June 2004. Retrieved 4 October 2008. ^ Adler, Shawn (7 December 2007). "What Would "Potter" Have Been Like with Tim Roth as Snape?". MTV. Retrieved 8 December 2007. ^ Linder, Brian (19 April 2000). ""Rosie" in Harry Potter?". IGN. Archived from the original on 31 August 2011. Retrieved 8 July 2007. ^ "WiGBPd about Harry". Australian Financial Review. 19 July 2000. Archived from the original on 8 September 2006. Retrieved 26 May 2007. ^ Ross, Jonathan, J. K. Rowling (6 July 2007). Friday Night with Jonathan Ross. BBC One. Retrieved 31 July 2007. ^ Rowling, J. K. "Rubbish Bin: J K Rowling Veto-ed Steven Spielberg". J.K. Rowling.com. Archived from the original on 18 April 2006. Retrieved 20 June 2006. ^ a b c Schmitz, Greg Dean. "Harry Potter and the Sorcerer's Stone (2001)". Yahoo!. Archived from the original on 15 December 2007. Retrieved 9 August 2008. ^ Douglas, Edward (10 July 2006). "A Good Night for Harry Potter?". ComingSoon.net. Retrieved 20 October 2007. ^ a b Linder, Bran (28 March 2000). "Chris Columbus to Direct Harry Potter". IGN. Archived from the original on 13 January 2008. Retrieved 8 July 2007. ^ a b c Sragow, Michael (24 February 2000). "A Wizard of Hollywood". Salon.com. Archived from the original on 10 July 2007. Retrieved 8 July 2007. ^ Linder, Brian (17 May 2000). "Bewitched Warner Bros. Delays Potter". IGN. Retrieved 8 July 2007. ^ "Harry Potter and the Sorcerer's Stone misc notes". tcm.com. Harry Potter and the Sorcerer's Stone – Misc Notes. Retrieved 21 October 2015. ^ "Harry Potter at Leavesden". WB Studio Tour. Archived from the original on 23 September 2012. Retrieved 16 September 2012. Filming began on Harry Potter and the Philosopher's Stone at Leavesden Studios on Friday 29th September 2000. ^ Linder, Brian (2 October 2000). "Potter Pics: Hagrid, Hogsmeade Station, and the Hogwarts Express". IGN. Retrieved 9 July 2007. ^ Linder, Brian (28 June 2000). "All 7 Harry Potter Books to Film?". IGN. Archived from the original on 25 April 2009. Retrieved 8 July 2007. ^ "Euro-AICN Special Report: Harry Potter, and a Little Bit on Aardman's next". Ain't it Cool News. 20 June 2000. Retrieved 8 July 2007. ^ Linder, Brian (5 September 2000). "Another Hogwarts Location for Potter". IGN. Archived from the original on 19 October 2007. Retrieved 8 July 2007. ^ a b c Linder, Brian (26 September 2000). "Potter Privet Drive Pics". IGN. Archived from the original on 26 April 2009. Retrieved 8 July 2007. ^ Linder, Brian (3 October 2000). "Potter Pics: Part Two – The Hogwarts Set at Durham Cathedral". IGN. Archived from the original on 19 October 2007. Retrieved 9 July 2007. ^ Linder, Brian (25 October 2000). "Hogwarts Oxford Location Pics & Rowling Speaks". IGN. Archived from the original on 25 April 2009. Retrieved 9 July 2007. ^ Sheperd, Ben (7 July 2007). Harry Potter: behind the Magic (TV). ITV1. ^ a b Linder, Brian (25 November 2000). "Potter Set News & Pics". IGN. Archived from the original on 31 August 2011. Retrieved 9 July 2007. ^ a b Linder, Brian (21 February 2001). "Lumos!". IGN. Archived from the original on 31 August 2011. Retrieved 10 July 2007. ^ "A Conversation between JK Rowling and Daniel Radcliffe". Youtube. ^ a b c d Cagle, Jess (5 November 2001). "The First Look at Harry". Time. Retrieved 19 September 2007. ^ a b Linder, Brian (8 January 2001). "Davis Confirms Potter Role". IGN. Archived from the original on 26 April 2009. Retrieved 9 July 2007. ^ Linder, Brian (11 January 2001). "Potter Creature Feature". IGN. Archived from the original on 26 April 2009. Retrieved 9 July 2007. ^ Oliver, Glen (17 August 2000). "Harry Potter Composer Chosen". IGN. Archived from the original on 19 October 2007. Retrieved 8 July 2007. ^ a b Linder, Brian (23 May 2001). "Potter Postlude". IGN. Archived from the original on 25 April 2009. Retrieved 11 July 2007. ^ Linder, Brian (6 February 2001). "Screenwriter Kloves Talks Harry Potter". IGN. Archived from the original on 19 October 2007. Retrieved 10 July 2007. ^ Dadds, Kimberley; Miriam Zendle (9 July 2007). "Harry Potter: Books vs films". Digital Spy. Retrieved 10 July 2007. ^ Linder, Brian (13 December 2000). "Potter Poster Pic". IGN. Archived from the original on 11 October 2008. Retrieved 9 July 2007. ^ Linder, Brian (28 February 2001). "Potter Preview Premieres Tomorrow". IGN. Archived from the original on 19 October 2007. Retrieved 11 July 2007. ^ Thorsen, Tor (12 December 2003). "Sorcerer's Stone Ships Out". GameSpot. Archived from the original on 30 September 2007. Retrieved 29 July 2007. ^ Linder, Biran (10 February 2000). "Mattel Wins Harry Potter Toy Rights". IGN. Archived from the original on 19 October 2007. Retrieved 8 July 2007. ^ Linder, Brian (14 February 2000). "Hasbro Gets Harry Potter Merchandise Rights". IGN. Archived from the original on 26 April 2009. Retrieved 8 July 2007. ^ Linder, Brian (1 June 2001). "Son of Harry Potter LEGOs". IGN. Archived from the original on 19 January 2012. Retrieved 11 July 2007. ^ a b "Amazon.co.uk". Retrieved 20 November 2010. ^ "Amazon.com". Retrieved 20 November 2010. ^ Brown, Kenneth (7 December 2009). "Harry Potter and the Sorcerer's Stone Blu-ray Review". blu-ray.com. Retrieved 17 July 2010. ^ Murray, Rebecca (6 May 2004). "ABC Offers a Sneak Peek at "Harry Potter and the Prisoner of Azkaban"". About.com. Archived from the original on 3 December 2012. Retrieved 9 October 2012. ^ Bennett, James; Brown, Tom (2008). Film and Television After DVD. Routledge. p. 19. ISBN 9781135896720. ^ "Potter Casts Spell at World Premiere". BBC News Online. 15 November 2001. Retrieved 23 September 2007. ^ ""Harry Potter" Magically Shatters Records". Hollywood.com. 18 November 2001. Retrieved 21 September 2007. ^ Gray, Brandon (6 May 2002). "'Spider-Man' Takes Box Office on the Ultimate Spin: $114.8 Million". Box Office Mojo. Retrieved 7 February 2010. ^ "November 23–25, 2001 Weekend 3-day Thanksgiving Weekend". Box Office Mojo. Retrieved 24 November 2013. ^ "November 30 – December 2, 2001 Weekend". Box Office Mojo. Retrieved 24 November 2013. ^ "Weekend Report: 'Catching Fire,' 'Frozen' Set Thanksgiving Records". boxofficemojo.com. Retrieved 2 December 2013. ^ "Harry Potter Smashes Box Office Records". Newsround. 19 November 2001. Retrieved 11 July 2007. ^ Irvine, Chris (30 October 2008). "Mamma Mia Becomes Highest Grossing British Film". The Daily Telegraph. Retrieved 16 November 2008. ^ "Potter Makes Movie Chart History". Newsround. 19 February 2002. Retrieved 11 July 2007. ^ "2001 Worldwide Grosses". Box Office Mojo. Retrieved 29 May 2007. ^ "Worldwide Grosses". Box Office Mojo. Retrieved 19 May 2010. ^ "Harry Potter and the Sorcerer's Stone (2001)". Box Office Mojo. Retrieved 31 May 2016. ^ "Harry Potter and the Sorcerer's Stone (Harry Potter and the Philosopher's Stone) (2001)". Rotten Tomatoes. Retrieved 8 July 2007. ^ "Harry Potter and the Sorcerer's Stone". Metacritic. Retrieved 20 July 2007. ^ "CinemaScore". cinemascore.com. Archived from the original on 22 July 2018. Retrieved 22 July 2018. ^ Ebert, Roger (16 November 2001). "Harry Potter and the Sorcerer's Stone". Chicago Sun Times. Retrieved 8 July 2007. ^ Hiscock, John (4 November 2001). "Magic Is the Only Word for It". The Telegraph. Retrieved 21 September 2007. ^ Morrison, Alan. "Harry Potter and the Philosopher's Stone". Empire. Retrieved 21 September 2007. ^ Linder, Brian (17 November 2001). "Brian Linder's Review of Harry Potter and the Sorcerer's Stone". IGN. Retrieved 9 June 2007. ^ Aufmuth, Jeanne. "Harry Potter and the Sorcerer's Stone". Palo Alto Online. Archived from the original on 12 October 2007. Retrieved 20 July 2007. ^ Puig, Claudia (16 November 2001). "Visually stunning 'Potter' falls short of pure magic". USA Today. Retrieved 9 October 2010. ^ Honeycutt, Kirk (9 November 2001). "Harry Potter and the Sorcerer's Stone". The Hollywood Reporter. Archived from the original on 4 August 2007. Retrieved 21 September 2007. ^ McCarthy, Todd (11 November 2001). "Also Playing: Harry Potter and the Sorcerer's Stone". Variety. Retrieved 19 October 2010. ^ Corliss, Richard (1 November 2001). "Harry Potter and the Sorcerer's Stone: Movie Review". Time. Archived from the original on 10 July 2007. Retrieved 29 July 2007. ^ Tatara, Paul (16 November 2001). "Review: 'Potter' well acted, heavy handed". CNN. Retrieved 21 September 2007. ^ Rogers, Nathaniel (December 2001). "Harry Potter & the Sorceror's Stone". TheFilmExperience.net. Archived from the original on 1 December 2010. Retrieved 24 November 2010. ^ Gonzalez, Ed. "Harry Potter and the Sorcerer's Stone". Slant Magazine. Archived from the original on 14 December 2007. Retrieved 21 September 2007. ^ Elvis Mitchell (16 November 2001). "FILM REVIEW; The Sorcerer's Apprentice". The New York Times. ^ a b "Results Page for Harry Potter and the Sorcerer's Stone – Academy Awards Database". AMPAS. Archived from the original on 9 June 2014. Retrieved 17 July 2010. ^ a b "BAFTA Film Nominations 2001". British Academy of Film and Television Arts. Archived from the original on 21 September 2010. Retrieved 21 October 2010. ^ a b "The 2001 Saturn Awards". MovieWeb. 13 June 2002. Retrieved 21 October 2010. ^ a b "Artios Award Winners". Casting Society of America. Retrieved 21 October 2010. ^ a b "WINNERS FOR THE 4th ANNUAL COSTUME DESIGNERS GUILD AWARDS". Costume Designers Guild. Archived from the original on 8 July 2011. Retrieved 21 October 2010. ^ a b "AFI AWARDS FOR MOTION PICTURES 2001". American Film Institute. Retrieved 21 October 2010. ^ a b "6th Annual Excellence in Production Design Awards". Art Directors Guild. Archived from the original on 4 March 2012. Retrieved 21 October 2010. ^ a b "2001 Broadcast Film Critics Choice Award Winners and Nominations". Broadcast Film Critics Association. Archived from the original on 15 February 2012. Retrieved 19 October 2010. ^ "AFI's 100 Years of Film Scores Nominees" (PDF). Retrieved 19 August 2016. ^ a b "Awards & Festivals: Harry Potter and the Philosopher's Stone". Mubi. Retrieved 26 December 2017. ^ "25th Japan Academy Prize" (in Japanese). Japan Academy Prize Association. Archived from the original on 26 May 2008. Retrieved 8 August 2013. ^ "Harry Potter und der Stein der Weisen". Blickpunkt: Film (in German). Retrieved 26 December 2017. ^ "Top Film, TV, Cable Composers Honored at BMI's Annual Film/TV Awards". Broadcast Music, Inc. 14 May 2002. Retrieved 26 December 2017. ^ "Eddie Awards for 2002". Internet Movie Awards. Retrieved 3 February 2011. ^ "Evening Standard British Film Awards 1990–2001". London Evening Standard. 10 January 2003. Retrieved 26 December 2017. ^ Hobbs, John (10 February 2002). "Sound editors tap noms for Golden Reel Awards". Variety. Retrieved 26 December 2017. ^ "Artist: John Williams". Grammy Award. Retrieved 26 December 2017. ^ "2002 Hugo Awards". The Hugo Awards. Archived from the original on 7 May 2011. Retrieved 3 February 2011. ^ "Nickelodeon's "Kids' Choice Awards 2002" Premieres April 20". Nick and More!. 5 March 2002. Retrieved 26 December 2017. ^ "'Lord of the Rings,' 'Fast and the Furious' top MTV Movie Award nominees". MTV News. 23 April 2002. Retrieved 26 December 2017. ^ "PFCS Awards for 2002". Internet Movie Database. Retrieved 3 February 2011. ^ "'Shrek,' 'Harry Potter,' 'Lord of the Rings' among producing guild's nominees". Associated Press. 11 January 2002. Retrieved 21 October 2010. ^ "2002 6th Annual SATELLITE Awards". International Press Academy. Archived from the original on 7 January 2010. Retrieved 21 October 2010. ^ "Previous Sierra Award Winners – 2001". Las Vegas Film Critics Society. Retrieved 26 December 2017. ^ "2002 TEEN CHOICE AWARDS". The Oklahoman. 18 August 2002. Retrieved 27 December 2017. ^ "23rd Annual Young Artist Awards 2002". Young Artist Foundation. Archived from the original on 5 September 2014. Retrieved 21 October 2010.